The Aegis II is Kimber’s 9mm pistol built on their Ultra-Carry platform. 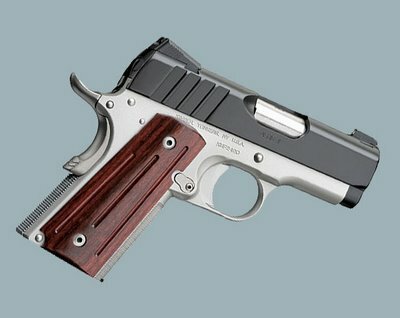 This is a strikingly beautiful pistol. The matte black steel slide contrasts nicely with the satin sliver alloy frame. 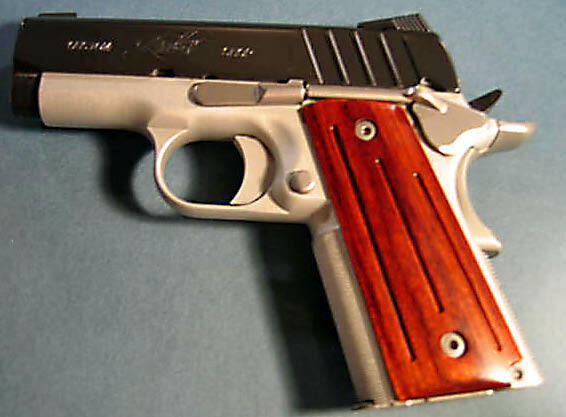 The appearance is further enhanced with a set of very slim and very attractive rosewood grips. The grips are fluted rather than checkered and, with the 30 LPI checkering on the front of the grip frame, the pistol is easy to hold onto. The Aegis II is topped off with a set of low profile tritium night sights. Although I do not have the specifications, the 9mm Aegis II is thinner than the Ultra-Carry CDP .45 ACP that I traded off about a year ago. This pistol is meant for concealed carry and, while a little large to be a full-fledged pocket pistol, the Aegis II would hide very easily under any light jacket, vest, or other outer garment. 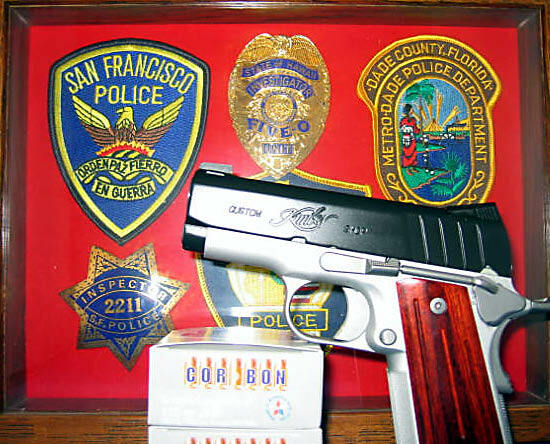 The pistol is 4.75 inches tall, 6.8 inches long, and weighs in at a very respectable 25 ounces. The Aegis has a 3 inch bull ramped barrel and a spring loaded full length guide rod assembly. The slide to frame and barrel to slide fit is very good and was so tight that I had some difficulty removing the slide for its initial inspection. The rear slide serrations are spaced wider apart than most 1911’s and I actually found this easier to grip. All of the edges have been “carry-melted” by the Kimber Custom Shop including the magazine release and safety and the melt treatment caused me no problems in manipulating either device. 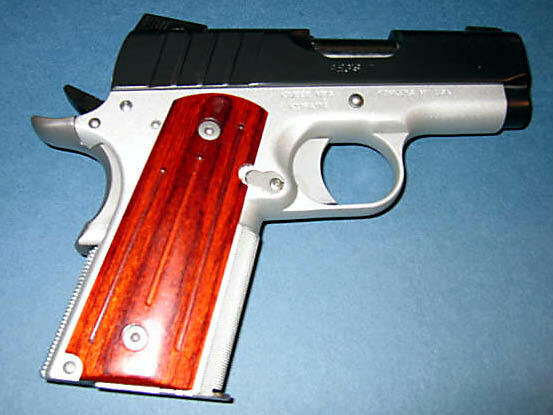 The hammer spur has been bobbed giving it the appearance of a Para Ordnance LDA hammer, although the Aegis II is a traditional “cocked and locked” single-action 1911 style pistol. As with most Kimber pistols the Aegis II only comes with one magazine holding 8 rounds. I am sure that aftermarket mags are available and perhaps someone makes a magazine that holds an additional round. 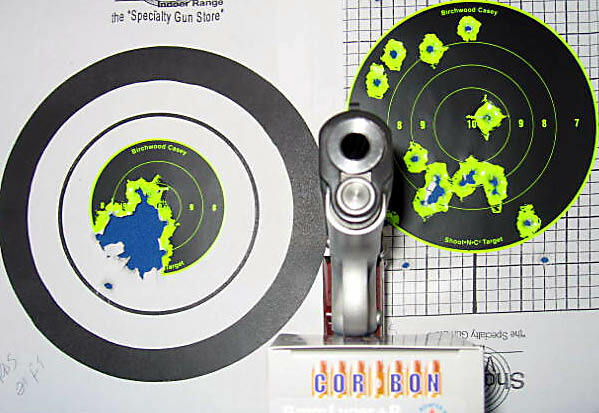 Target to the left was the first fifty out-of-the-box fired at 21 feet. The target on the right was 24 rounds fired at 21 feet. This pistol was a blast to shoot! Even though this is a lightweight gun the 9mm recoil was pretty tame.  Another surprise was the out-of-the box reliability. 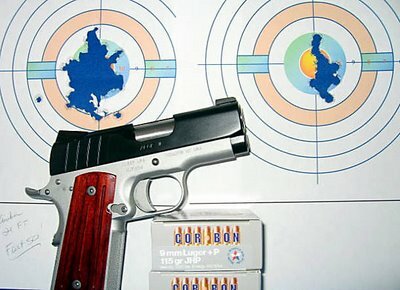 Kimber states that their pistols require a break-in period of 500 to 700 rounds. 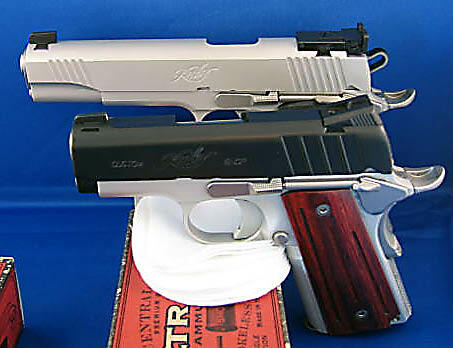 When I purchased my Kimber Raptor the gun was blindingly accurate but a jam-o-matic until reaching round number 700. Because of this I took a box of 250 Remington UMC 115 grain FMJ ammo to begin the breaking in process. During the shoot-in I only encountered 2 failures to feed out of the 250 rounds. Target to the left was set at 21 feet and fired absorbed 34 rounds. 16 rounds where fired at the target on the right which was set at 50 feet. The accuracy at 21 feet was absolutely superb. At fifty feet the target opened up quite a bit but more that accurate enough for combat purposes. The Aegis II is definitely a keeper and offers a great balance of firepower and concealment.